"È lui! desso! L'infante!... 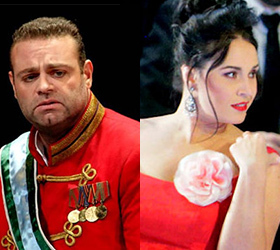 Dio, che nell'alma infondere"
Katherine talks to the Maltese tenor about his new album of arias from operas including Otello, Il trovatore, Don Carlo and Aida. For the love duet from Otello…he sounds marvellously virile and tireless…Calleja has not yet learnt the required inwardness for Otello’s two great monologues, but he has the voice for all these difficult arias and duets, and so long as he doesn’t attempt too much too soon he may well become the leading Italianate tenor of his generation. ...together with some expansive phrasing, his clean diction, musicianship and intelligent engagement exemplify the conscientious artist; he attacks the final note fortissimo before diminishing to nothing. Among the best things here is the challenging 'O tu che in seno', Calleja supplying an exciting, thought-through reading of this touchstone among Verdi arias. Calleja is already supremely alive to [Otello's] vulnerability and volatility, and his golden tone has now darkened to a gleaming bronze which cleaves through the heavy orchestration in the two great monologues with easy clarity. Stylistically and temperamentally, he seems completely at home in this repertoire, never afraid to add faintly old-school expressive effects, though nothing ever seems contrived or histrionic. Any doubts about the most winning lyric “Italian” tenor since Pavarotti tackling this heavy Verdi repertoire are largely dispelled by the vitality of his sunny sound and the clarity of his diction. ...it’s in the selections from Otello that Calleja sounds most comfortable. Just when one would expect the voice to sink beneath the orchestral waves he provides precisely the refinement required, sings within his means and reminds us that not the entire role requires powerhouse bellowing. Ramón Tebar’s conducting is judicious and attentive.